Have you ever read an article, heard a presentation or watched a video that suggested that more supply chain collaboration between retailers and their suppliers is a bad thing? Didn't think so. Across the industry, there is general agreement that collaboration promotes a leaner, more profitable retail supply chain. So why isn't it happening on a grander scale? As a long-time proponent of collaborative distribution, KANE wanted to find out why, so we partnered with Peerless Research Group to interview 64 top logistics and supply chain executives -- half representing retailers and half representing suppliers. We asked all respondents essentially the same questions in order to see where the biggest alignment gaps were. The chart below notes the average responses of the two groups. When it comes to supply chain collaboration, both retailers and suppliers see great value, but neither group believes it is maximizing opportunities to work better with partners. 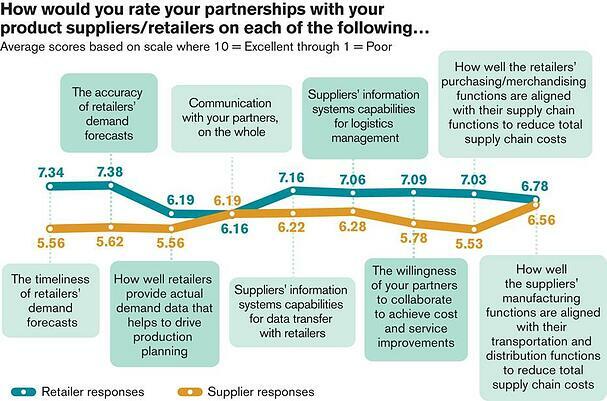 Retailers believe collaborative efforts are going better than their supplier counterparts. The biggest alignment gap between retailers and suppliers is the accuracy and timeliness of demand forecasts. According to one supplier, "Retailers don't concentrate on forecasting. Their attitude is 'I am your customer and I want it when I want it.'" Retailers believe that there is good alignment between the retail buyers who order the goods and the logistics department that receives the goods at the retail DC. In contrast, suppliers believe there is little communication between retail buyers and their logistics colleagues and, therefore, little effort to streamline inbound shipping and capitalize on load consolidation and other opportunities. Both retailers and suppliers agree that communication could be much improved. In fact, the most frequent comment from survey participants was simply that the two groups should "talk more." Small and mid-sized suppliers felt somewhat irrelevant to larger retailers. A typical comment, "Getting retailers to see you as not just a suppplier but a partner is an issue." There remains a lack of trust. Because collaborative initiatives require an investment of time and effort, both groups are fearful of participating in initiatives where the benefits are inequitable. No one wants to get the raw end of the deal. There must be transparent data sharing and the benefits need to be clear up front. To read the full detail on survey results, download the report here: Supply Chain collaboration research.